I'm in a kind of limbo now, after finishing up the main writing of the Masters, and waiting for the examiners grade and edits, so I can then publish the thing (here and in the University Library) and actually feel finished. As part of the process, I made a VR Work called Lieutenant Butterfly - ((Dragons)), using the Gear VR. The final examination of the work was using this as a centerpiece, with the paintings that had been completed all throughout the degree being displayed next to it. This will be available to download through itch I think, (if you own a Gear VR) very soon. I considered the final work as a kind of diagram in relation to the writing, so when the writing has been published here, it will make slightly more sense - but the VR work can still be experienced on it's own. I just want to get the writing up at around the same time. So far, outside of the course I've been involved in a couple of things - a couple of game jams and the recurring youtube babble 'Night Mission' - recorded and edited by Alexey Botkov of Frogshark. 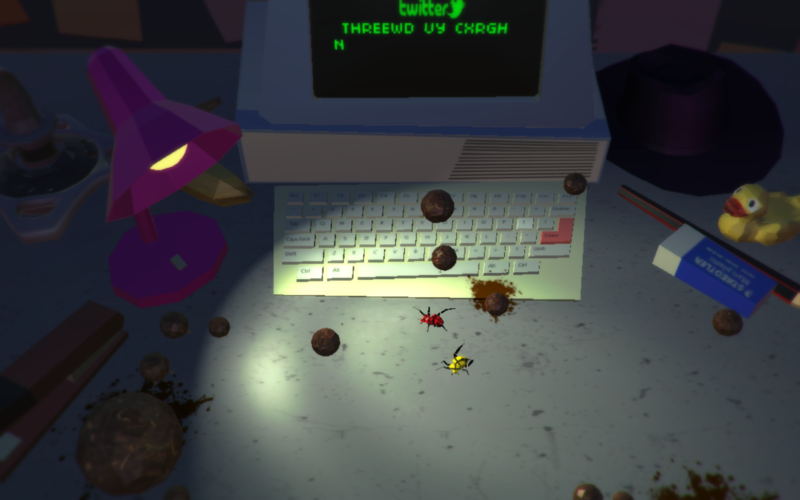 As for the Gamejams - first was Kiwijam 2015, where I teamed up with Chris Lyne and Mike Blythe to make a game about dung beetles, and the second was the recent Ludum Dare, where I made a game about being a monster. Both of these made me think about different ways of using Playmaker, the visual programming software I use in conjunction with Unity. Even though the community is really informative, there doesn't seem to be a lot of best practices when it comes to collaborative works, and managing larger projects. With 'HeartMonsterrr' - I tried to adopt a MVVM approach, (at least before I had to rush to make the deadline, and things got a bit messy at the end, as well as an unclear understanding of the approach itself) - and split all the concerns appropriately. It might not be the most appropriate structure for visual coding in the first place, but helped me think about managing larger projects. I also attended the Creative Gaming Symposium at AUT, and am currently doing a few hours tutoring for a Digital Design paper there - talking through themes, and managing production of some student projects. Really need to get some more work, or start finding other ways to make a living.